The comics professional and fan communities are such tight-knit groups that we often say that when you come to C4, you’ve joined the family. The dedication that our friends on BOTH sides of the table show for their passions is not only the cornerstone of what we’re all about, but it inspires us to want to do our best and be community-inspiring superheroes outside of the convention floor as well. Cherry Capital Comic Con is a huge believer in being community-minded and giving back to help others- and each year, we choose a charity or two to benefit from funds that we raise throughout the weekend through our art auction and promotions held in partnership with our friends at the 501st and Rebel Legions as well as the local Ghostbusters costuming groups. Lori’s Voice is a 501(c)(3) non-profit organization which was founded and established to help young people with disabilities. This organization evolved from Lori Hastings great love for children and the realization of so many challenges young people face when living with a disability. Living with a disability herself, Lori understands the medical needs that are not covered by insurance. Lori’s Voice takes great pride in the fact the our entire organization along with our fundraising activities is completely handled by volunteers. No one at our organization takes a salary. the Application for Assistance tab, and return to Lori’s Voice. Once we receive the application, the review board will make a decision based on your needs and qualifications. www.heroinitiative.org The Hero Initiative is the first-ever federally chartered not-for-profit corporation dedicated strictly to helping comic book creators in need. The Hero Initiative creates a safety net for comic book creators in medical or financial need. 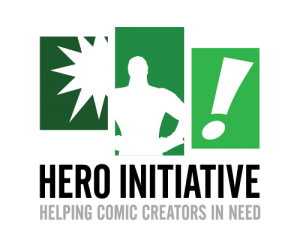 The Hero Initiative has benefited creators and their families with over $800,000 worth of much needed aid, fueled by your contributions. It’s a chance to give back to those who have given us so much enjoyment! Proceeds raised from Saturday’s Art Auction & Steve Dillon Drink & Draw will benefit The Hero Initiative.